It’s fitting that Matt Mitchell’s other release this year, the excellent FØRAGE, is a collection of Tim Berne tunes. Like Berne, Mitchell deals in the subterranean and the serpentine - any given piece is bound to have layers upon layers for the listener to work through, and there’s a dizzying intricacy to all the twists-and-turns that pop up. But here’s the thing: it never feels like a chore. Mitchell is a master of fusing the accessible and the arcane, and his music never lacks a sense of unbridled (if disoriented) joy. Matt Mitchell’s last album of original recordings, in 2015, was the brilliant and expansive Vista Accumulation. That release, with its lengthy run-times and winding, exploratory compositions, could potentially be a forbidding entry-point into Mitchell’s complex sound-world, but A Pouting Grimace, his latest for Pi Recordings, condenses and refines the elements that made that previous album such a delight. Despite a significant trimming-down of track lengths, there are no compromises made with regards to either the compositions or the personnel performing them. The pieces here are just as heady and labrynthine as ever, and Mitchell has pulled together some of the best names in contemporary jazz to help breathe life into the project - people like Ches Smith, Tyshawn Sorey, and Anna Webber, to name but a few. “Bulb Terminus” is a brief preamble of sorts, led entirely by Mitchell. In the span of a minute, it gently dips the listener into an inert pool of electronics; when “Plate Shapes” comes in, however, that pool is better likened to a vortex. Performed by a septet, the piece is immediately striking for its rather unusual instrumentation, not to mention the idiosyncratic compositional elements. Along with Mitchell’s cascading piano-work, Ches Smith (on vibraphone) and Patricia Brennan (on marimba) help to create a playful sense of urgency; twinkling cataracts fall from every direction, and even Mitchell’s Prophet 6 synthesizer joins in at one point. Jon Irabagon and Sara Schoenbeck keep the piece suspended in a surreal, carnivalesque atmosphere - Schoenbeck’s nasally bassoon flits and flutters about in the left channel, while Irabagon takes on an exciting, incendiary sopranino sax solo that is a sight (or sound?) to behold. Kim Cass supplies the next piece, “Mini Alternate,” with a strutting bass-line that would be rather funky if not for Scott Robinson’s rubbery bass sax figures sprawling themselves out overtop, all while Kate Gentile (on drums) and Dan Weiss (on tabla) keep the track locked into a relentless groove that meshes perfectly (if not predictably) with Mitchell’s manic repetitions. Mitchell’s strengths as a player are on full display here: while his left hand conjures up dense tonal clusters, his right zigs-and-zags, looping away from and back into the central melody with aplomb. “Brim” is cut from similar compositional cloth, but features a wider array of instrumentation and a greater number of players - twelve, all in all. It’s not surprising that the famed Tyshawn Sorey has been handed conducting duties here. The piece is a veritable maelstrom, with each player engaged in their own hectic, contrapuntal dance; to be sure, though, it’s not complete chaos. If anything, it resembles the stop-and-go flow of city traffic. On the ground, in the midst of it, things can be overwhelming and incomprehensible. Hang out for a bit above the surface, however, and you can see the underlying order. Likewise, “Brim” operates within its own internal logic, and each listen offer up new layers of rhythm, flow, and flux. On the Pi Recordings webpage for the album, it’s noted that “Brim” is “the primordial genetic broth of the whole record,” with all of the other tracks being derived from it. In some ways, then, it’s a skeleton key, with compositional notches and protrusions that you’re likely to spot elsewhere on the record. “Deal Sweeteners,” another Mitchell-led electronic excursion, closes out the first half of the album with soft, cyborgian swathes. Compared to the sonic density of some of the prior tracks, the opening of “Gluts” comes across as laconic. Mitchell and bassist Cass engage in a dizzying dance with one another, with Gentile echoing Mitchell’s complex shapes on the drums. Midway through, Anna Webber (alto flute) and bassoonist Schoenbeck step in, unleashing abstractions that are as gentle as they are circuitous. Not soon after, though, “Heft” parts with any semblance of tenderness, thunderous drums and rumbling bass sax working together to cast the piece in an uneasy, apocalyptic glow. In the second half, Irabagon screeches out yet another wild solo, notes raining down like fire-and-brimstone. After such an explosive track, it’s perhaps fortunate that “Sick Fields” is so sparse; despite being performed by a dectet, the piece moves about in splintered segments, individual instruments rising up from the ashen muck only to disintegrate again. If “Brim” represents ceaseless flux, then “Sick Fields” denotes the ruptures, the breaks and hesitations. Final piece “Ooze Interim” is once again led entirely by Mitchell; compared to the unremitting movements that make up much of the rest of the record, this last track might as well be a slab of granite: it pushes forward slowly, the distended tones only occasionally broken up by electronic drip-drops of sound - very much like beads of water falling from a stalactite. As a closing track, you couldn’t ask for much more. It counteracts the frenetic flow of the other pieces with its own dilated sense of time and, while it doesn’t offer up any definite sense of closure, it produces a quieting effect that helps the listener to contemplate all that they’ve just heard. In A Pouting Grimace, several experiments are being carried on: experiments in composition, in tone, texture, and technique, and even experiments in just how one should construct an album. 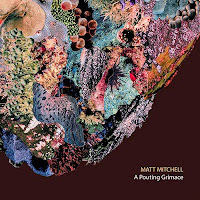 For the most part, Mitchell’s latest work is a roaring success - the record feels complete, and there’s a sense of narrative heft here that many similar-sounding projects lack. Not to mention, the pieces themselves are incredibly listenable; sure, there might be multiple melodies vying for your attention at any given moment, but it can’t be denied that each one of those melodic threads is worth following. With A Pouting Grimace, Mitchell has taken the best elements of his previous work and, as if by alchemy, melted them down into gold. Don’t let the title fool you - you won’t be grimacing when you finish this one. My favourite album of this year with "Irreversible Entanglements"